For the 3rd year, Nate Libby’s friends and family will paddle together as Team Jude in the Bath Savings Institution Paddle for Pine Tree Camp. Nate is a state senator from Lewiston. His eight-year-old son Jude attended Pine Tree Camp’s day program, Camp Pine Cone, for the first time last summer. Jude was one of 650 Maine children and adults with disabilities to experience Pine Tree Camp’s week-long day and overnight programs and leave behind the confines of their disability on the camp’s barrier-free, fully accessible 285-acre campus. After their first paddle, they toured the camp with Jude. At Pine Tree Camp, Jude enjoys the playground, taking boat rides, swimming in the lake and going for walks in the woods. This summer, Jude will attend day camp again and, on June 3rd, Team Jude will be on the Kennebec River for the third time, paddling with teams from around New England to support Pine Tree Camp. The goal is to raise $68,000 and all proceeds from the 21st annual Bath Savings Institution Paddle for Pine Tree Camp directly support the Campership Fund and are a critical part of the Camp’s open door tuition policy. Since 1945, Pine Tree Camp has welcomed all who could benefit, regardless of their ability to pay. 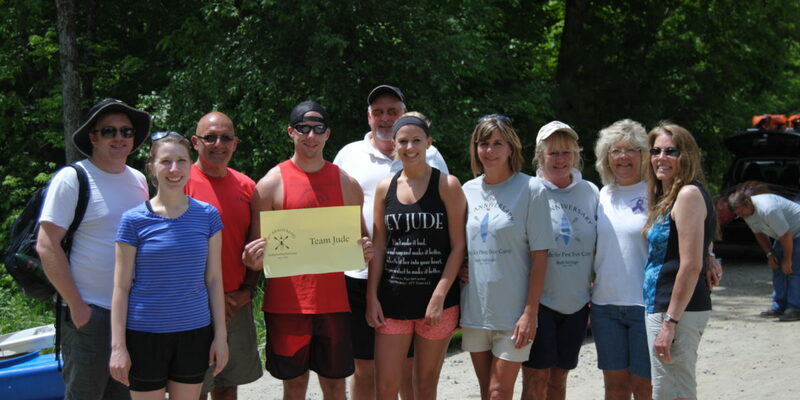 Along with 250 other paddlers, Team Jude will set out from Evergreens Campground in Solon for a seven-mile kayak trip down the Kennebec to North Anson, raising money for the Campership Fund. 99% of campers cannot afford to pay the tuition and this paddle is a major fundraiser to ensure they can attend not just this summer, but for years to come.